Aged 30, with a wife and daughter back in Australia, Bob Hay was slightly older than the rest of Mick Martin’s crew. Born in Renmark, South Australia on 4 November 1913, Robert Claude Hay was the son of John and Margaret Hay. He attended Renmark High School and graduated from Roseworthy Agricultural College in 1935, where he also excelled in sports. The college swimming pool is now named in his honour. 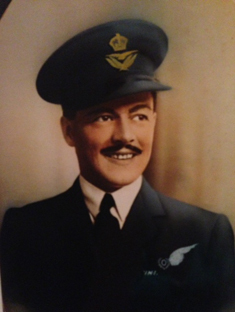 He joined the RAAF in the summer of 1940, trained in Australia and Canada and arrived in England a year later. His first posting was to 455 (Australia) Squadron, where his time coincided with future colleagues Mick Martin and his crew. Like them, in April 1942 he was posted to 50 Squadron to fly on heavy bombers when 455 Squadron moved to Coastal Command. He served a full tour of operations, flying mainly as navigator with one of the squadron’s best known pilots, Sqn Ldr Hugh Everitt, in a crew which also contained fellow Aussie and future 617 Squadron colleague, Fred ‘Spam’ Stafford. By the time 617 Squadron was formed, Hay had been commissioned and been awarded the DFC. As an Australian from 50 Squadron he slotted easily into the crack Martin crew, and his slight age advantage and extensive experience made him the obvious choice for the important role as the squadron’s Bombing Leader. This new job meant that within days of his arrival, he flew to Manston with Gibson to watch a test drop of the new Upkeep weapon at Reculver. The first, dropped by a Wellington, was successful, but the second, dropped by a Lancaster, broke up. Flying back in a small Magister, he and Gibson had a lucky escape when its single engine failed. Gibson managed to crashland in a field full of devices designed to stop enemy gliders landing. Hay was one of the four who were told the target on the night before the raid, along with Melvin Young, Henry Maudslay and John Hopgood. Although the rest of the squadron didn’t know for certain when the operation would take place news that they had been summoned to a meeting in Charles Whitworth’s house led to fevered speculation on the base. Earlier that day, Hay and most of the rest of Martin’s crew had been on board AJ-P after it had been loaded with its mine. Intelligence officer Fay Gillon was also inside the aircraft, being given a tour. Suddenly, with a crash, the mine dropped onto the ground and everyone on board and outside beat a hasty retreat in case it exploded. The weapon hadn’t been fused, so it did not explode but its delicate mechanism may have been damaged, as when it was finally dropped at the Möhne Dam, it veered to the left and exploded at the side. Hay received a bar to his DFC for his role on the raid, and played his part in the celebrations that followed. He can be seen in the raucous photo taken at the Hungaria Restaurant, wedged between Tom Simpson and Toby Foxlee, with a glass in his hand. After the raid, Martin’s crew eventually went back on operations, although Leggo and Chambers eventually left to train as pilots. A new CO, Leonard Cheshire, arrived and Hay spent a lot of time working on training his bomb aimers to use a new device, the Stabilised Automatic Bomb Sight (SABS). Several months passed until February 1944 when, under Cheshire’s leadership, a detachment set off to bomb the Antheor Viaduct in southern France, an important rail link to Italy. Paul Brickhill devotes a whole chapter of The Dam Busters to what happened to Martin’s crew on this operation describing in vivid detail his bombing run and the way the aircraft rocked as it was hit by a cannon shell which exploded in the ammunition tray under the front turret. Eventually Martin managed to land his battered Lancaster in Sardinia, on a small airfield run by the Americans. Hay’s body was removed from the aircraft and he was buried the next day in a cemetery in Cagliari. He was the only one of Martin’s Dams Raid crew who did not survive the war. Martin was himself quite shaken by the episode, and did not fly again on operations with 617 Squadron. A few months later, however, he had recovered his poise and was back in a Mosquito squadron. We were shocked with the news of the loss of Flt Lt Robert Claude Hay, DFC and Bar and African Star, a much respected and loved member of the College staff and the Gold Medalist in 1935. Before his enlistment in 1940 he was assistant horticulturist at the college. Both as a member of the staff and as a student Bob Hay, with his happy, carefree disposition, more nearly symbolised the life of an agricultural college student than anyone I’ve known. Hay had married Honoria (Edna) Thomson in 1938. They had one daughter. Further information about Bob Hay and the other 132 men who flew on the Dams Raid can be found in my book The Complete Dambusters, published by History Press in 2018. Given my understanding that Martin was designated to take over command of the raid if anything happened to G-George, and the roles of Leggo as navigation officer and Hay as lead bomb aimer, its interesting to see the Aussie represention on the raid was so significant ( even though they were only 12 of 133). Not that I’m being ‘parochial’. Graeme, my grandfather was Bob Hay so I may be biased but I too believe that the Australian contribution was significant. I was lucky enough to be at a very moving memorial service in Adelaide on the 70th anniversary to honor the 3 South Australians in the dams raid. It was covered by two television stations so I feel their efforts are definitely being more widely recognized. I just stumbled across this post when searching for information on Bob Hay. He was my Great Uncle, so I guess we must be related! Although Aussies obviously played a very significant role in 617 Squadron, Micky Martin was not Guy Gibson’s deputy on the Moehne raid – “Hoppy” Hopgood had that role. Also, just to add another comment re the deputy role, here is a quote from a Guy Gibson Letter which puts Melvin Young squarely in the role ….